There is nothing wrong with giving your children the things they want. It makes them happy, and it makes parents happy to see them happy. But, there is a lot that they can learn by making the money themselves and using that money to make their own buying decisions. The problem is that making money as a kid or even a teenager can present a lot of challenges. Our society is set up to make sure our kids are getting an education above all else and that means limiting their opportunities to earn money on the side. That being said, there are still tons of ways for kids of most ages to earn money. Thanks to the Internet, there are dozens of different ways that your kids can earn money without leaving your house. Unfortunately there are tons and tons of various scams on the Internet that serve no purpose other than trying to steal your personal information. The good news is, there are a few legitimate sites where your kids can make some extra money to buy all those things they’ve been begging you for. Swagbucks – is one of the most popular money making sites right now. You have to be 13 or older to join with your own account. Create an account on the site, accomplish some of their tasks, collect Swagbucks. After that, you can redeem these Swagbucks for real life gift cards. They have gift cards to just about any store your child could ever want to shop at. Sign up for a Swagbucks account or you can learn more about the program and all the ways you can earn money in our Swagbucks review. Cash Crate – A direct competitor to Swagbucks, CashCrate gives you the same options and has to same 13 year old sign up age. They are most famous for their paid surveys, but there are a ton of different ways to earn cash through this top program. Where CashCrate really excells is their referral program. Now most of these get paid to do stuff online programs will have some sort of referral ability, but CashCrate will pay you 20% of whatever your referrals make, as well as, 10% of what your referrals referrals make. So if Johnny gets Tyrieqe to sign up with his referral link and Tyrieqe gets Cindy to sign up with his referral link, Johnny will get a 20% referral comission on whatever Tyrieqe makes and 10% referral comission on whatever Cindy makes. Johnny will also get a $3 bonus when Tyrieqe earns his first $10 on CashCrate. The referral program actually gets more generous the more people you refer, but that is the basics. I put CashCrate second on this list because I believe SwagBucks pays a little better for the stuff you do, but don’t miss their referral program. If you can get the referral dollars going, this program gets very powerful VERY fast. Sign up for a new account with CashCrate and get a $1 bonus just for confirming your e-mail. Inbox Dollars – Inboxdollars has all the ways to make money as Swagbucks and is one of the oldest get paid to sites in the United States. The only downside is that you have to be 18 to sign up and start earning. This eliminates most people in their teens unless a parent is willing to sign up. Learn more in our InboxDollars review about all the different ways you can earn money with this program. Pay Your Selfie – This is one of the most unique ways that you kids can make money, and it’s one of the most entertaining. If your kids have a smartphone, you understand that they already take dozens of pictures of themselves, maybe it’s time they get paid for those selfies. Sure, it sounds a little creepy, but it’s a legit site. It should be noted that under the Pay Your Selfie app rules and regulations that you have to be at least 18 years old to receive payment from the site. After you create a free profile, you can browse dozens of different tasks on the Pay Your Selfie app. These tasks could be anything from taking a picture with your dog or with some scrambled eggs. Okay, if you’ve never heard of Pay Your Selfie, you probably have a lot of questions right now, like, “why would anyone pay my child for pictures of themselves?” Well these pictures are either used by Pay Your Selfies as marketing tools or they are sold to other brands to market their products. The idea behind it is pretty simple. In some cases, a task may require a selfie with a certain brand or product. Take a picture, earn cash, and when you accumulate at least $20, you can cash out. Easy as that. Since there are distinct differences between the money earning ability of different ages we are going to split the ideas up by age group. Teenagers have the largest earning potential of the age groups and are able to do most of the things that younger kids can do to earn money. Sell Drinks – My mind always drifts back to a small kid with a lemonade stand, but todays kids have more options. Go to an open event and sell water bottles for $1 or get up early and sell hot chocolate to the Black Friday shoppers. There are lots of ways to sell drinks and being a cute kid will prompt many people to buy just for support. Dog Service – You may not be ready for some larger dogs this age but there are plenty of people out there who have dogs that more resemble rodents. If they are busy or live in the city then dog walking is a great way for you to make a few dollars. Bake Sale – Most mixes are pretty easy to follow these days. Make sure you pick a busy place to have it or set up your bake sale when you parents are doing a garage sale. Weed Maintenance – people have weeds in their yards and pretty much everyone hates pulling them. Start a weed pulling service and ask neighbors if they want to hire you. Recycle – common metals fetch a pretty good price at the for profit recycling services. Aluminum, copper, and even scrap metal add up and can be a good way to score some cash as a kid. School Supplies – Find a good source for inexpensive but fun pencils, erasers, candy, etc. and sell them at school to your friends. The Dollar Store is a great way to go with this one. Garbage Can Service – Offer to move people’s garbage cans to the curb and back again for trash day. You can even throw in an add on for cleaning the cans. Play an Instrument – If you are good at playing an instrument that can be moved around easily, find a public place to play and leave the case or a hat out for people to donate to you. Used Golf Balls – Golfers lose golf balls all the time. If you can find a friendly course owner, go out and find all the lost golf balls in the trees, bushes, and tall grass. Clean the balls up and resell them to golfers looking to save a few bucks over the cost of new golf balls. Put on a Show – if you have a bunch of kids in your neighborhood, put on a play or puppet show and charge admission. As you get older the number of jobs available to you expands. Not only are kids in this age a little more responsible, they also have the capacity for reaching things on higher shelves. Washing Cars – Being small has it’s advantages, people don’t mind when you climb up on the top so much and you can do a really good job from up there. Children’s Book Repair – Kids beat the snot out of their books. Do some research on best practices and then offer to repair children’s books for local moms. Duct Tape Wallets – I have seen lots of kids with these and if you put some design work into them you could sell them to friends. Fresh Eggs – Get some chickens and sell those farm fresh, free range eggs to your neighbors. DVD rental – If your parents bought you every DVD in sight as a kids, rent them out to your friends for a small fee. Garage Sale Selling – People who set up garage sales are frequently just trying to get rid of stuff while making a little money. At the end of the day, go around to the garage sales in the area and see if they will give you stuff. Turn around and do your own garage sale or sell the good stuff on Craigslist. Pine Nuts – You will want some gloves for this one, but pine nuts are super expensive to buy because they are not exactly easy to extract from pine cones. Find a buyer first, but you can get some pretty good coin for doing the work. Ladybugs – Ladybugs are the gold standard for gardeners. Breed them at home and sell them to the people near you. Plant Watering – Some people get so busy they forget to water their plants. Offer to come by and do the watering for them. Strip Wires – This takes some time but you can then recycle the copper wiring for a good profit. Car Sitting – When parents go to the store with small children, one of the things they dread is getting multiple kids out of the car and then refereeing while in the store. Offer to come a long and sit with the little ones in the car while the parent enjoys the quiet in the store. Shoe Shine – People still need several pairs of shoes shined. Go from door to door offering this service. Mom Assistant – Mom’s have tough jobs. If you can come by and help out for an hour or two they will pay you well. Window Washing – Another job that people hate to do and will pay kids good money if done well. Camper Cleaner – People who own campers do not like the job of getting on top of them and cleaning off the gunk. Boat Cleaner – Boats need at least an annual cleaning. If you are already doing their camper why not get them to do the boat too? Kids in this category are just a few short years from part-time jobs. Getting yourself some experience with work will go far for landing that first part-time job at a local restaurant or store. Baby Sitting – This is the old tried and true option. Babysitting pays pretty well for anyone that can handle the responsibility of children. Get certified in CPR and you can charge even more. Mow Lawns – I did this for a summer. It’s hard work in the heat, but the pay is good. Music Lessons – If you are a musician then you can take on younger students who are just starting out. House Sitting – When people leave town their pets need to be fed and let out, plants need to be watered, and it looks good to have the mail being collected. At this age I would stick to people in your neighborhood. Sell Soap – there are a ton of different ways to make soap and people love specialty soaps for their home. Car Detailing – If you are good at cleaning, people will pay really well to get their car spotless. Movie Editing – Videographers always need help editing videos for their clients. Outdoor Movie Theater – Set up an outdoor movie and charge admissions. Make sure to sell drinks and popcorn too. Craigslist Free Section – People give things away all the time on Craigslist. Go pick them up and resell them for a nice profit. Grout Cleaning – I hate cleaning grout and would definitely pay someone to do it for me. Refinishing – There are tons of ways to refinish old furniture and lamps. Pinterest is your friend here. Wreath Making – Once again Pinterest can guide you into making awesome wreathes people will place on their doors or in their homes. Christmas Stuff – If you can sew there is a ton of Christmas items, like stockings and tree skirts, that people will pay well for. Decorations – If you have some crafting skill then you can sell decorations for just about any holiday. Potato Guns – I would stick to making the air pressure kind since the combustible potato cannons can explode. Learn to Knit – Knitting is a skill that less people are doing. Hand made knitted items can go for good prices. Vinyl Letter Making – Vinyl letters are a big hit. You will need to get some money for the device that cuts them and some supplies, but people pay good money to get adhesive vinyl letters these days. Baby Hair Bows – Tons of different hair bows out there. If you can get the sports team themed ribbons you can absolutely kill it during football season. Referee – If you are familiar with the rules of a sport, sign on and get paid to referee. Small Business Billing and Collections – It is hard for small businesses to get around to collecting on past due accounts. Work for them by putting together envelopes and mailing out the collection letters. Personal Assistant/Runner – People who own businesses have tons of busy work that take them away from working on their business. Work for them doing some of that busy work. Singer – If you have a good set of pipes, sing at restaurants or for some church services. Sell Stuff by Raffle – Instead of just selling an item, set up a raffle where people pay a small amount and whichever person’s name is drawn gets the item. This can do much better than selling items to a single person. Laser Tag – Make a laser tag course in your back yard and charge admission. Paint Faces – If you have some artistic talent, paint faces at a park or at small events. Coach a Sport – If you are an accomplished athlete, sign up to coach a team of much younger kids. Caricatures – Artists have lots of ways to make extra cash. If you are good at it, people will pay to have these cartoon images done of themselves. Foreign Language – people are big into getting their kids speaking other languages. If you are fluent, set yourself up as a foreign language tutor for little kids. Horses – If your parents have a bunch of land and a barn, care for people’s horses and charge boarding fees. Headlight Restoration – They make fairly inexpensive kits for getting the fog off of headlights. It is easy to do and people pay the companies big bucks to do it. Go check out the rates from the big companies and undercut them. Once you hit this age you can go apply for part-time jobs. This can be a source of frustration for some teens who are having problems getting jobs that will work with their school schedule. If you don’t want to go the traditional route use the ideas for the younger age groups or here are some other ideas that can get you going. Christmas Lights – I hate putting up Christmas lights. If you offered to put them up for the right price, I would definitely pay you for it. Cook Dinners – People are having more problems cooking dinners from home. If you get off from school and whip up a meal for them once a week they would pay you well. T-Shirt Business – Teens love custom t-shirts. If you can come up with good ideas for sayings or are able to monogram (yes I live in the South) then you can make good profit selling t-shirts. Laying Sod – Homeowners obsess about their lawns. Get in good with the local feed and seed and they may refer you as a person to lay sod. Change Oil – It’s a quick and simple job on most cars. You only need a few supplies and can charge a nice price for doing this at a person’s home. Swim Lessons – If you are good at swimming you can work with kids to help them learn too. There are tons of tutorials on Youtube. Dog Houses – People are treating their pets more and more like children. A custom doghouse is a must for these fur-parents. Become a DJ – That guy at the dance is getting paid to play good music. If you have a big collection and good taste you can get paid for it too. Learning to speak to a crowd will make you more money. Fix Computers – People mess up their computers and printers all the time. If you are tech savvy then fix them for them. Windshield Repair – You can find repair kits at your local auto store. You can usually get a bunch of repairs out of one kit. Custom Sandboxes – Some carpentry skills and plans on the internet and you will be in business. Make sure to add a custom cover so that cats don’t mess up the box. Run Errands – Once you can drive you become very useful for running errands. If you cannot drive yet, just wait and see what your parents give you to do once you can. Carpet Cleaning – You can rent a carpet cleaner from your local grocery store or Wal-Mart. Line up several houses for one day and clean them all on one rental. Foreclosure Cleaner – When a bank forecloses on a home they pay people to clean up the mess that was left. It isn’t a pretty job, but it pays well. Photographer – If you have a nice camera you can make good money as a photographer. Learn how to edit pictures and you will make much more. Kid Party Planner – Moms want to put on amazing parties “for their kids”. If you can help them with planning and games they will definitely pay you to make it a big event. Rent-A-Friend – There are many home-bound seniors who need someone to come and spend time with them. Their families will pay you to come by, play games, and listen to their stories. Laughing at bad jokes my be a requirement. Teaching your children will start to understand the value of a dollar is an important goal for all parents. They will see how much it actually costs when they buy that tee shirt or video game. Spending their own $20 is drastically different than asking you to purchase it. One they start buying their own stuff, you might notice that they ask you for things less frequently than they used to. 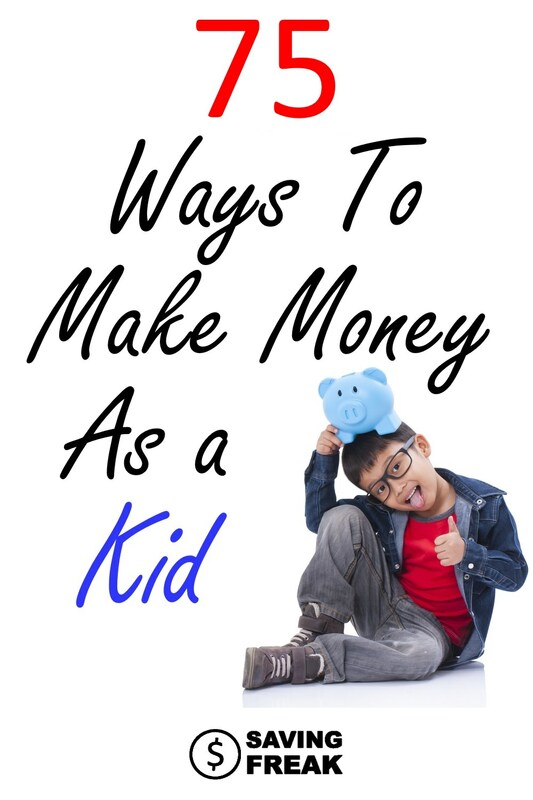 Another major plus to kids making their own money is they now qualify to invest. They will have to have earned income that gets filed with the IRS, that is why I recommend that people 13+ take advantage of those online options for earning money. Once they have that they can start their own Roth IRA. Imagine having all that time for interest to compound in your favor. Whatever reason you or your child decides to push in this direct, it is a great way to teach many things about life and should absolutely be encouraged.